Photographing fun fairs is to a degree different in the daytime and at night. In the daytime, generally you want to stick to available light and not use flash, and a lot of thought goes into how to record movement, and how much do you include. 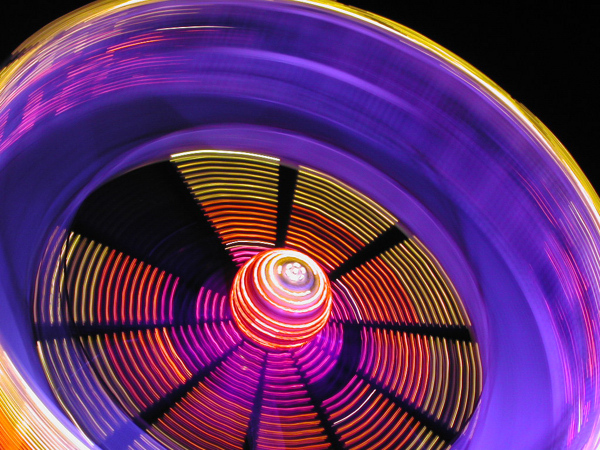 There are travelling fairs, the type that visit every town and many villages through the better months of the year, and also static fairs within theme parks, attractions and more. You also gets parts of fairs on some coastal piers. At night the atmosphere and photographic opportunities change, while in the day it has been a part of a landscape, at night its a world of its own, and while some of the features of the night time fairs, like sound and smell you cannot include in photographs the image possibilities are fantastic. The lights from side stalls and attractions have pools of light, and with colour and movement its an interesting challenge to record. Longer exposures and time exposures record items moving, and like the images above often forms a full circle, lights that flash tend to draw dashes while lights on all the time form full circles. If you want longer exposures than will just work out with the lowest ISO, then use a neutral density filter to extend the exposure time. Try using different speeds to see the effect you get, you should be able to get a motion blur but still see people. Metering systems can cope well with these challenges, and exposure in many situations is not too critical, the thickness of light tracks are adjustable by changing the exposure, so a smaller aperture (towards f32) will make this light tracks thinner. Candid shots at night are often more effective using higher ISO and available light rather than using flash. With flash you tend to loose the atmosphere and light pool effect plus of course people tend to notice you a lot more. When using flash, set it at rear flash, this will show the light tracks but the flash will freeze nearer items in their final positions. Colour balance is another area to consider, often the colours effects of the fair lights is what we want, and recording in Raw means we can set another white balance setting afterwards, if we don't like to effect we have. Play with silhouettes, reflections and as many other things as you can spot.